Arlington isn’t waiting for spring. This juvenile male is making serious tracks to the north — the first of this winter’s class of tagged owls to show more than just some late-winter wanderlust. 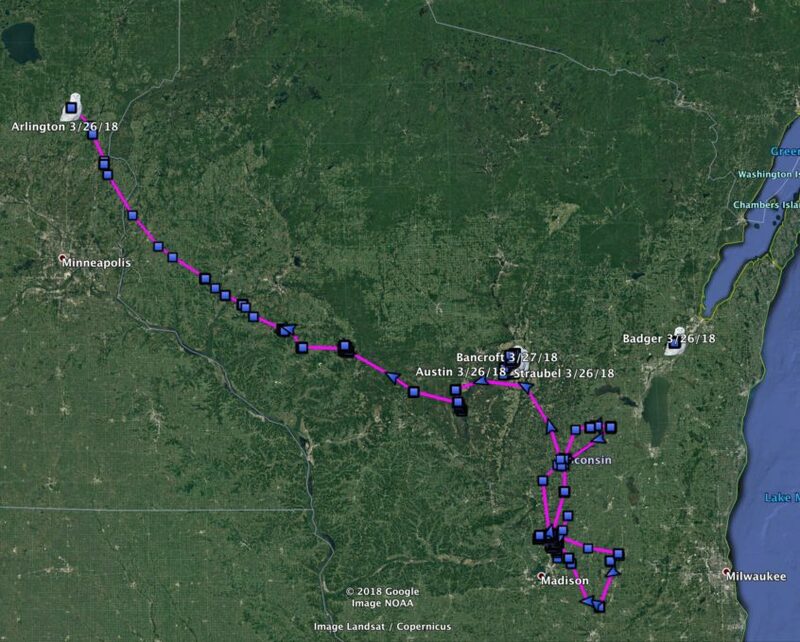 In just the past week he’s moved more than 120 miles (200 km) from south of Eu Claire, Wisconsin, northwest into Kanabec County, Minnesota — and more than 260 miles (420 km) from where he was tagged Jan. 4 near his namesake town in southern Wisconsin. There’s lots of ground to cover this week, so we’ll move from west to east, starting with Pettibone, who checked in for the first time in a few weeks, still on his 10-square mile (25-square-km) territory straddling Stutsman and Kidder counties in North Dakota. That area has spotty cell coverage, which is why we hear from him only irregularly — and likely why we haven’t heard from Ashtabula, who last was just to Pettibone’s northeast, since March 19. Our Wisconsin trio of Austin, Bancroft and Straubel continue their dance around each other, providing a really rich and fascinating look at how snowies using the same patch of land respond to each other (and likely to other, untagged owls in the same area). All three juveniles are using a patch of the Buena Vista grasslands about 7 square miles (20 square km) in extent, with the larger female Straubel occupying the center and, until recently, the two males keeping to the margins. This past week, though, Austin shifted southeast, to another area of commercial cranberry bog, while Bancroft — who had first staked out this territory early in the winter — moved close to Straubel and into what had been Austin’s bailiwick to the northwest. The proximity of Bancroft and Straubel prompted one commenter to ask if the two might be pairing up. Fun as that might be to contemplate, it’s unlikely — snowy owls require a number of years to mature, and both of these birds are less than a year old. There’s also little evidence that snowies pair on the wintering grounds; it seems more typical for adults to pair up once the male has established a territory on the breeding grounds. Rounding out our Wisconsin owls, Badger remains a homebody on her farmland territory northeast of the town of Freedom, WI. And up in the U.P. 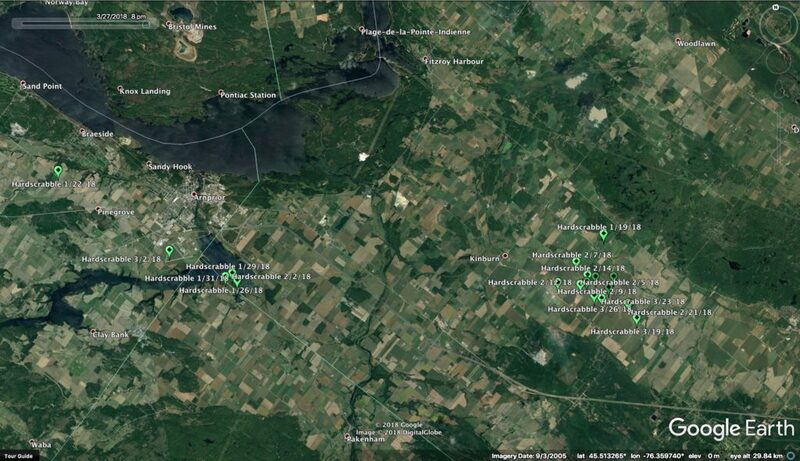 of Michigan, there have been no changes for Pickford and Pennington — this juvenile female and adult male remain where they’ve been all winter, in farmland about 50 miles (81 km) south of Sault Ste. Marie. No word since Feb. 28 from Gichigami, when she was out on Lake Superior’s ice. We have been hearing only intermittently from Sterling, whose transmitter has been struggling to maintain power; he’s likely one of those birds that likes to preen the unit way down into his back feathers. But he remains near Holland and Zeeland, MI, on the east shore of Lake Michigan. 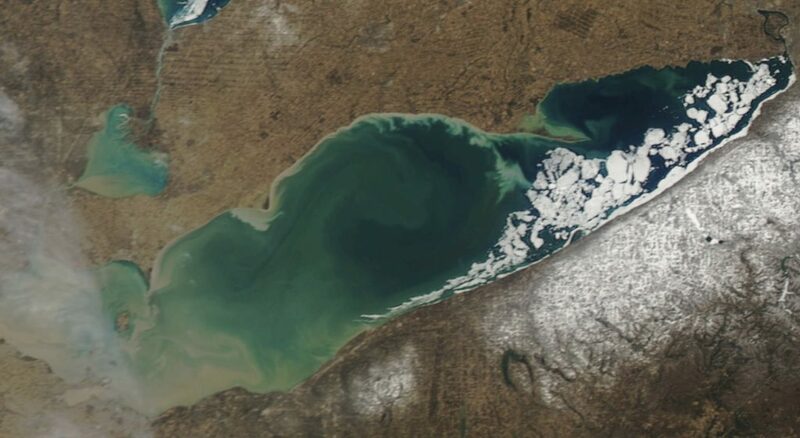 Meanwhile on Lake Erie, the rapidly disappearing ice there has pushed Hilton onto land with increasing frequency, and lately she’s been on and off the lake between Presque Isle and the town of Northeast, Pennsylvania, and farmland between Ripley and Westfield, New York. On Amherst Island, Stella and Emerald are still holding tight to their routines. Stella has lost all the remaining ice on the Lake Ontario side of the island, and now spends all her time on shore, where she’s a favorite with photographers and visiting birders. Emerald has taken advantage of the limited ice remaining on the channel to the mainland, and spent much of the day March 27 out there. With all the turbine construction this winter, Amherst has been a noisy place, but both it and neighboring Wolfe Island have seen large influxes of owls in the past week or two — possibly from early migration, possibly owls chased off the melting ice onto land. Local photographer Dale MacNair reported finding 21 owls on Amherst this week, and our friends Daniel and Patricia Lafortune counted an astounding 40 snowies on Amherst last weekend. Farther east along the St. Lawrence, Chickatawbut remains where she’s been all winter, near the town of Louiseville, Quebec, while Wells remains in the thick of things in Quebec City, roosting on a large shopping mall, hunting the margins and medians of several very busy highways, and occasionally escaping the hubbub out on the river (presumably on floating ice). Speaking of urban owls, Logan continues to hunt Boston’s outer reaches in Revere and Chelsea, just across the Mystic River from the downtown. 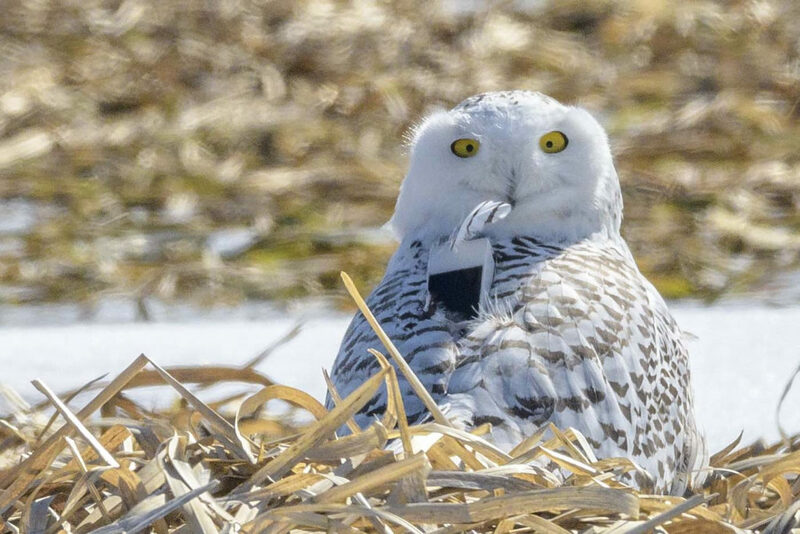 Norman Smith, who tagged her and moved her from Logan Airport, is concerned about what she might be eating in such an urban environment, since he knows of a number of snowy owls in the Boston area that suffered from rodenticide exposure this winter, having eaten poisoned rodents. Moving down the coast, Sinepuxent is still using the salt marshes just inland of Atlantic City, while Island Beach continues to bop around south Jersey, from Stone Harbor and Avalon down to Wildwood. Finally, Lenape seems to have found some peace and quiet at long last on the Virginia barrier islands on the Eastern Shore’s Atlantic coast, most of which are part of the Nature Conservancy’s Virginia Coast Reserve. Unlike some of the beaches farther north, which are accessible by vehicle and where snowy owls are continually flushed by overly enthusiastic (or simply careless) humans, Lenape has been able to rest out on these out-of-the-way islands where people are fairly rare visitors. Owl overlaps and interacting. Last travels of deceased owls and possible reason for death. Flanders was tagged 2 years ago at my parents home in Cape Vincent, however, I see no mention of him. 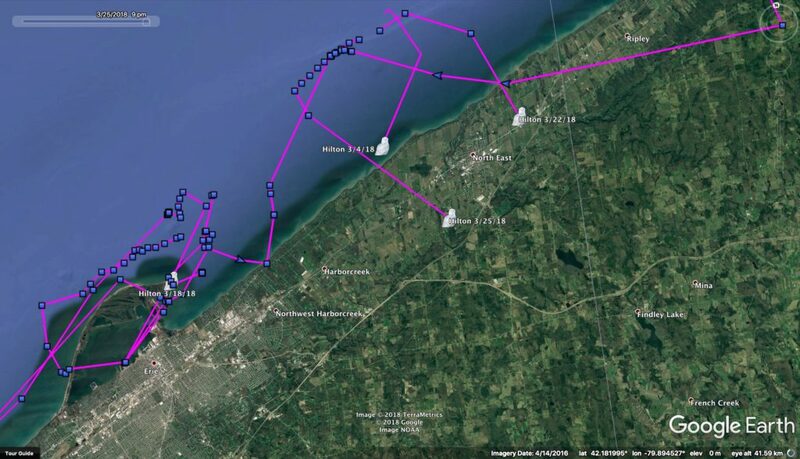 Flanders hasn’t come back south into cell range since her last transmission in March 2016, when she was on the north shore of Lake Ontario. While it’s possible something has happened to her in the interim — life is dangerous for any wild bird — she was an adult when tagged, which means her annual survival odds are very good. 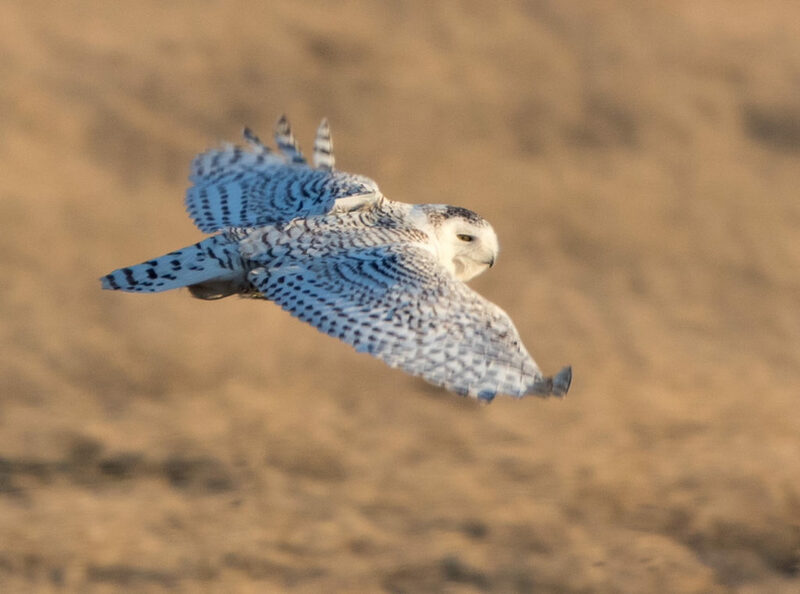 And we know, from satellite tagging that Laval University has conducted with breeding adult females in the Arctic, that some snowy owls actually go north for the winter, and remain on the Arctic sea ice near permanent openings in the ice called polynyas, where they hunt sea ducks and alcids. We’re looking forward to the next generation of CTT transmitters, now in development, which will combine the GPS and cell network-based function of the ones we use now, with a new capability of connecting occasionally to the Argos satellite system, so we’ll be able to keep tabs on birds that Flanders that remain out of cell range for long periods in the Arctic and subarctic. Good to hear Lenape has found a quiet area to call his own…away from people. The overlapping tracks of the 3 Wisconsin snowies is very interesting, wonder who will begin moving north first. Hope Logan is not eating those poisoned rodents. Thanks for the updates Scott!!! 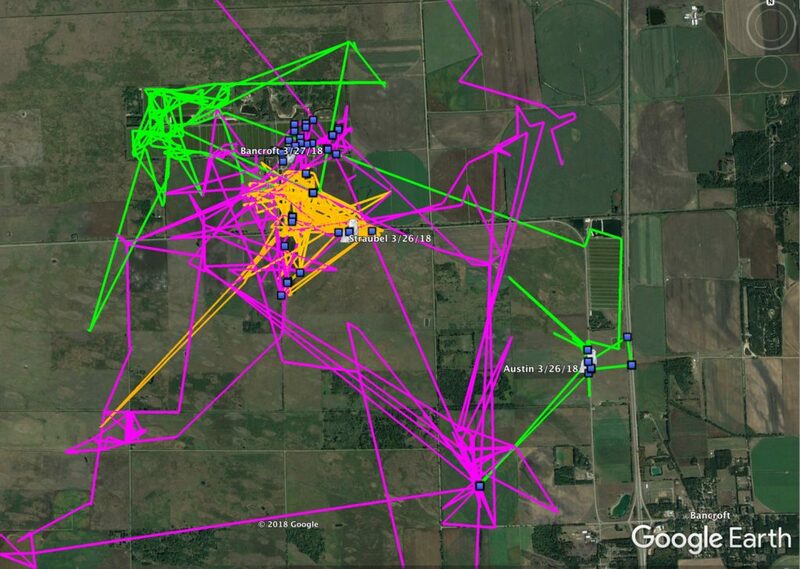 Utterly enormous tracking devices and monitoring of same. You are all doing an amazing and such vital collection of statistics. I’m pretty sure Logan was on my roof two nights in a row, 3/29 and 3/30 in Revere. I would love to get in contact with someone to see if he was actually tagged here. I do have pictures of the snowy owl that was up there both nights. What you guys do is amazing and I truly hope the gorgeous owl we were fortunate enough to view has not been poisoned by anything around here he may have been eating. We can’t prove it, but I’d argue that having a snowy owl on your roof is definitely a sign of good luck. However, Logan wasn’t tagged in Revere; she was was caught at Logan Airport in Boston, tagged and released on Cape Cod, but then moved back up the Mass. coast and spent the late winter in Revere. 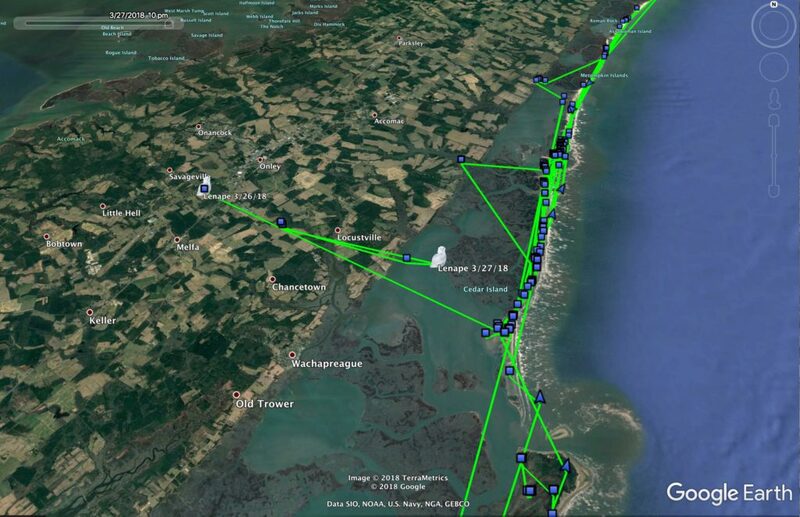 Check out her latest maps — she’s all the way up on the St. Lawrence River in Quebec now.